Last night, I wanted to use Google Sites Liberation tool, and downloaded the .jar file, but I could not open it with my Windows 10 laptop. To be honest, I have never used or execute any jar files before, and I used the .jar on Windows 10 laptop that did not have any Java installed. Follow this tut if you want to upgrade to Windows 10. 1. Whenever I double clicked the .jar on Windows 10, it was opened automatically with my .zip opener programs, so it ended up with having extracted files from the jar in folders. Now, if yours also will be opened with any ZIP opener, like Winrar, you might want to check this video first to see if it then works. If not, you can continue reading. 3. Then I created a batch file in the same directory where the file was, and ran it by typing java -jar filename.jar in the command line, but it could not even open the Command Prompt app. 4. I downloaded and tried Java SE release, and again when I double clicked the file, it opened the Command Prompt, but it will be closed again in a few seconds. I was being so curious, so I wanted to fixed it without downloading any additional script or software, but I ended up using this tool from Johann Loefflmann, and it worked immediately. Once you downloaded this file, just double-click the jarfix.exe, and that’s it. Now you can open the .jar file, and it will work, how easy. double click it, and that’s it. I wish I tried this script earlier so I did not waste my time that much last night. 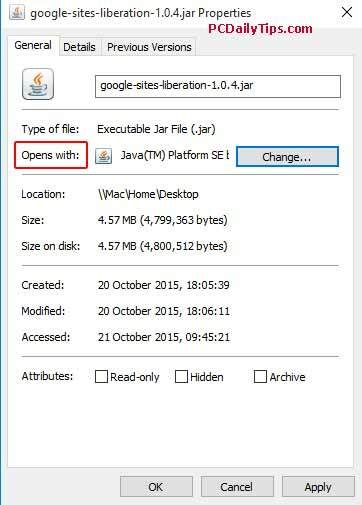 Hopefully you can now open your .jar on your Windows 10 machine too.